Eri Sun Village is a fun and relaxing place to get your holiday started from. You’ll find Eri Sun Village just 30km from Heraklion International Airport, situated along Crete’s beautiful northern coast. Rooms range from standard double rooms to larger Family Apartments that have two bedrooms separated by a partition. In addition, Eri Sun Village makes sure you have the essential amenities required for a comfortable stay such as air-conditioning, safe deposit box, TV and more. Guests will be able to enjoy the magnificent views around the hotel from their private balcony with sea and garden views available as well as pool views. At the main restaurant, you’ll be able to find local and international dishes as well as a snack bar or head out and discover one of the many Greek Tavernas in the area as well as cuisines from around the world. If you just want to get out to the beach then jump in a taxi where a short journey will take you to Malia Beach and there’s excitement to be had at the two local waterparks and the Reptile Rescue Centre. Eri Sun Village sits just 30km east of Heraklion International Airport on Crete’s northern coast. Malia Beach is only 7km from the village. There are two waterparks close by to the village. 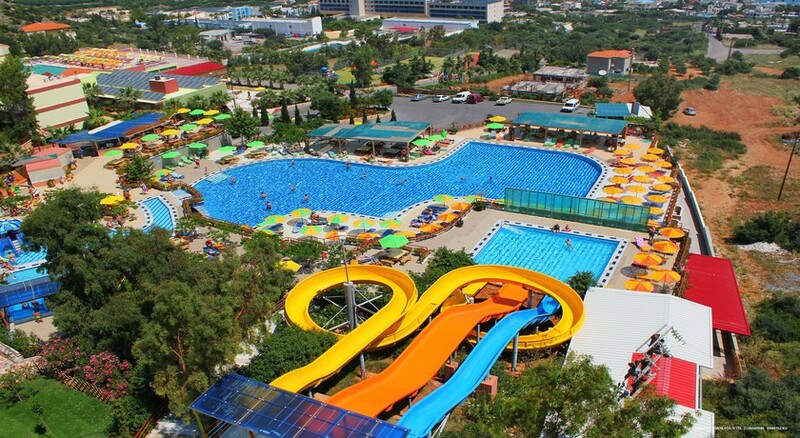 Acqua Plus Water Park is just 8km away whilst Watercity Waterpark is only 22km from Eri Sun Village. More thrilling family adventures can be found at Aquaworld Aquarium & Reptile Rescue Centre just 5km from the village and the Crete Aquarium sits 17km away. Eri Sun Village is within easy reach of many top restaurants and bars as it conveniently sits along the main thoroughfare of El. Venizelou. 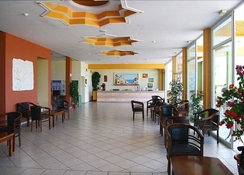 Eri Sun Village houses 280 well-furnished and comfortable rooms. A Standard Room comes with a double bed and an en-suite bathroom and sleeps up to three guests. A Family Apartment features two bedrooms comprised of one master bedroom and a separate children’s room, sleeping up to four guests. A Family Superior Apartment also features two bedrooms but is more spacious and is able to sleep up to five guests. All rooms come equipped with the essential amenities you’ll need for a relaxing stay such as air-conditioning, telephone, TV, safe deposit box (at an additional charge) and more. All rooms also come with a private balcony with beautiful views over the sea, gardens as well as views overlooking the swimming pool. 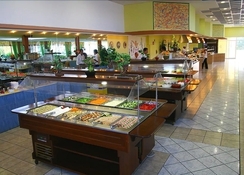 Eri Sun Village has a main on-site restaurant that serves breakfast, lunch and dinner that offers both local and international cuisine. There is also a snack bar available to guests where guests can pick up coffee and tea, cakes, soft drinks and more. There are also a number of great restaurants and bars to be found in the local area. A little down the road you can pick up traditional Greek fare at Taverna Gorgona as well as at Taverna 1930. Fine Mediterranean seafood combined with great sea views can be had at Ya Seafood Restaurant. Lighter fare and late night drinks can be had at Venus Restaurant Café Bar. Other great bars include New York Beach Club and Players Bar. At Eri Sun Village there are many great ways to unwind and relax. Guests can take a dip and cool off in the outdoor swimming pool or pull up a sun lounger and relax on the sun terrace. 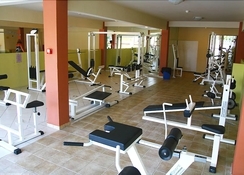 Guests can keep up their exercise regime at the on-site fitness centre. 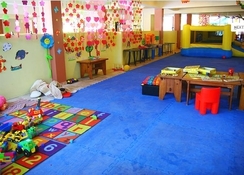 Children will enjoy joining the children’s club which has a dedicated programme with fun activities for young ones. Out and about there’s plenty to see and do, from historical sites such as the Roman Fountain and the Minoan Palace to natural attractions including Tauchplatz St. George Cave as well as the beautiful Malia Beach. Exciting adventures can be had at Safari Club Crete and at the two local water parks. Rooms were basic with old hard furniture. There was not much to do locally and facilities were very limited but staff tried their best and managers were friendly.